For the first six weeks after we got married, I was blissfully happy. I basked in the newlywed glow. I had a doting new husband. Everything was just peachy. But on week seven, something came along that put the kibosh on all of that. That something? Football. Little could I have known that a little pigskin and 22 grown men in skintight pants could turn my formerly attentive husband into a raging, all out football fanatic. I became a sports widow. At least on Sundays. And Monday nights. And, sometimes, Thursday nights, too. Initially, I did not take my newfound widowhood gracefully. But after a time, I realized that my attempts to win my husband’s attention on the weekends were somewhat futile. After the first few seasons, I even became resigned to the fact that, at least for 16 weeks out of the year, I was a sports widow. At least on Sundays. And Monday nights. And, sometimes, Thursday nights, too. But my husband sensed my growing discontent. And, in an effort to put a kibosh on my incessant whining and pouting, did something that changed the character of our marriage. Somehow, he convinced me to join his fantasy football league. At first, I wasn’t sold on the idea. I hated football. I knew nothing about the sport. But at least it gave us something to talk about on the weekends. And, surprisingly, I was pretty lucky when it came to picking my players. As it turns out, apparently Jay knew me better than I knew myself. Because for as much as I despised football? I hated losing even more. Partway through the first season, I realized that, in order to win at fantasy football, I actually had to know something about the sport. And so, I started watching. And, slowly, a transformation occurred. I actually started to like it. I began poring over the stats. I agonized over which running back to start. I rejoiced alongside my husband when the bad guys fumbled the ball. 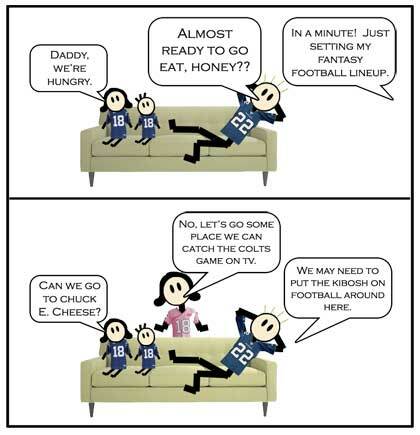 My husband says that introducing me to football may have been the best thing he did for our marriage. I don’t know if I’d go that far. But I can say that I now look forward to Sundays. And Monday nights. And, sometimes, Thursday nights, too. 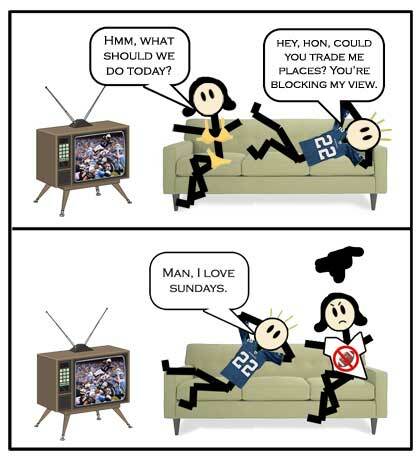 Love the "Say No to Football" T-shirt you're sporting in the second panel of the first comic. Do they really make those? Don't want to get creepy, but the bikini in the first panel is kinda flattering in a handless stick figure sort of way. 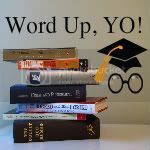 I really like the food that goes along with football and a chance to read my book, so I never complained about football. Until we had a baby.Now it's "I want him to watch the game with me! But can you keep him quiet so I can follow what's going on? "He's not 16, husband. You're gonna have to wait a few years to watch the game with him. Or keep him quiet yourself. We are football obsessed too. And fantasy football obsessed. My husband and I are in a couple's league with a bunch of our friends called "The Divorce League!". Because it has been known to cause some fights! hahaha But it is a great way to get involved in something that the husbands like. I have always liked football but now I seem to really be excited to watch certain games and can even talk about some of the players.Glad you are no longer a football season widow! So, a kibosh that turned into a not-so-much-kibosh. I loved your "that dude who is dating bridget moynahan. "I'm only a sports widow for 21 days a year, during Le Tour de France. LOL! This was great! Maybe that's what I'll need to do too. You are a better woman than I. I kinda hate football season. But sometimes I rise above it and let it lull me to sleep on the couch. That, or read my book like KLZ. Silver lining, I suppose. This is my FAVORITE post ever. Seriously! Great job and the illustrations are simply hysterical. Love the yellow bikini! Here's to fantasy football and bringing you to our side!! Love the cartoons…so funny! 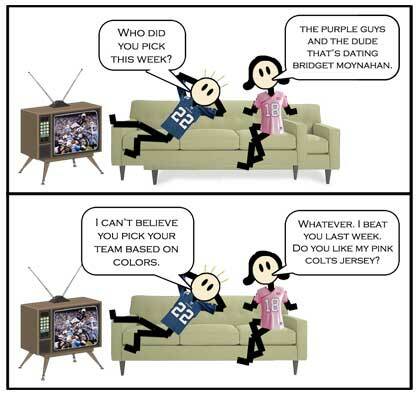 I totally know what you mean…I am a football widow, too. I've learned to live with it. Good for you for starting to like football…you're a better woman than me. I'm in 2 fantasy leagues. One is all women, the other is the one that my husband runs. I beat him last week, boy was he mad! Next Next post: Anyone know how to reach Anonymous?